NATO signed on Wednesday the Accession protocol for the future Republic of North Macedonia. This country will be the 30th member country of the Alliance. Following the signing of the Accession Protocol, Skopje can now take part in NATO activities as an invitee. 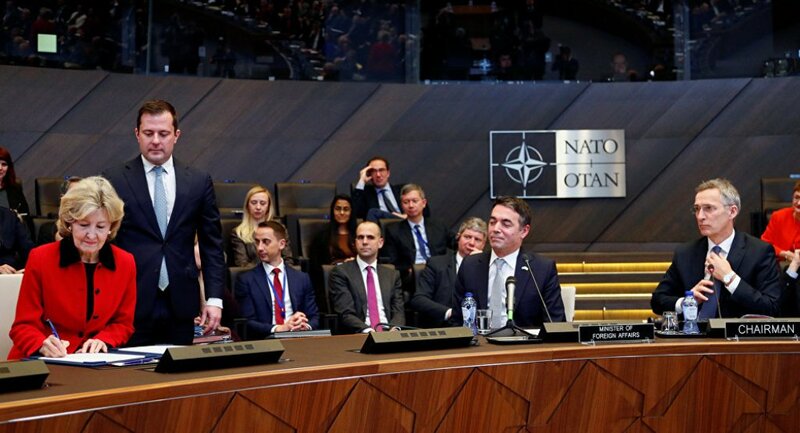 NATO’s Secretary General, Jens Stoltenberg said during the ceremony that this is the start of the process of ratification, while hoping that the process will continue without any obstacles in order to invite Skopje to become an omnipotent member of the Alliance. “You will keep up with the reforms, while NATO will offer its support. As of today, your representatives will accompany us on this table and they will be invited to participate in the NATO meetings”, he said. Stoltenberg expressed his gratitude for the courage shown by prime ministers Alexis Tsipras and Zoran Zaev. NATO’s Secretary General also said that Macedonia’s accession in the NATO will bring more stability and security in the region. Macedonian Foreign Minister, Nikola Dimitrov who signed the Protocol as representative of North Macedonia, stressed the contribution given by several generations for this day to come. He said that this was made possible after “prime ministers Zaev and Tsipras paved the way for this goal, while showing that the impossible is possible”. “For Macedonia, NATO means crossing the security line. NATO is a family of countries which have joined forces for security, stability and for a better world”, minister Dimitrov said. Before the full accession takes place, each NATO member country must ratify the protocol. Greece is expected to be the first country which will give the green light to the neighbouring country for its accession to NATO, after blocking this process for almost three decades due to the dispute relating to the name Macedonia. The dispute arises from the ambiguity in nomenclature between the Republic of Macedonia, the adjacent Greek region of Macedonia and the ancient Greek kingdom of Macedon. The Greek parliament is expected to ratify the protocol on Friday. Once this takes place, the Prespes agreement reached on 17 June 2018, which gave the country its new name Republic of North Macedonia, is made official. Skopje will inform the United Nations Organization and other international organizations on the new name, demanding them to use it.